So I was staring at my now coffee table ( I already have plans for a new one ) and I realized that my coasters where missing. Then I remembered, one of the dogs chewed half of them up and I threw them out a few weeks ago. 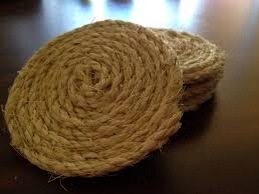 I loved these coasters, I mean LOVED, them. They where Mid Century Modern and if you know me, you know I love MCM. The coffee table looked empty with out them so I decided to make a temporary pair for now. 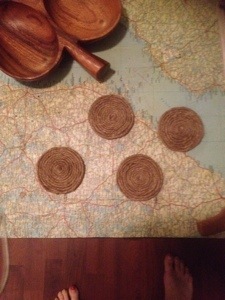 I saw these coasters somewhere months back and saved the picture to my phone. Had I realized I would be blogging about them I would have bookmarked the page. If you know the source please let me know. 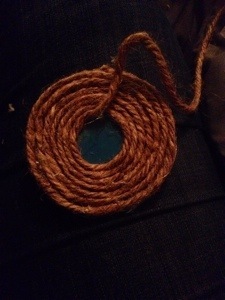 I know I have some rope and I thought maybe I would use some cardboard for the bottom. My thinking is that the rope will absorb the condensation from a cold drink enough, that it wouldn’t get the cardboard wet. I traced a can of beans on the cardboard and cut out my circles. 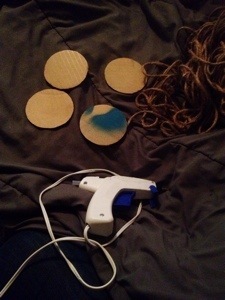 I decided to use my glue gun to adhere the rope to the cardboard. 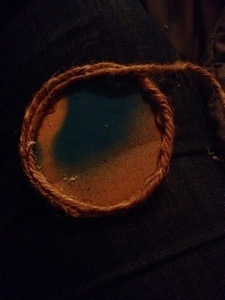 I just glued it on in circular pattern like on my inspiration pic. It was just that simple and easy. I spent no money since I had very thing on hand. 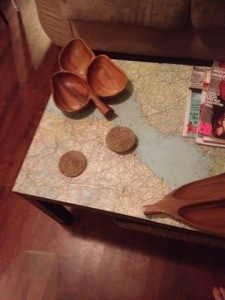 Here they are on my coffee table and I think they look great!